Home » After 45+ Years of practice, WHAT does Dr. Stephen Blake recommend for Optimum HEALTH? Over the past 45+ years as a veterinarian I have discovered many products that help optimize the healing of our bodies. My rule has always been to keep it as simple as possible and to always make my goal to prevent suffering and do no harm in the process of healing. This short video staring Dr. Yang and Medicine Man aka Dr. Stephen Blake is about optimum gut health. In the video he shares his nearly 50 years in medicine on the subject of gut health. To learn more please tune and watch and learn a simple way to maintain and optimum GI system. Where you go we all go. , After 20 years, Dr Stephen Blake finally wrote his book on Bovine Colostrum and self published it on Amazon.com on April 3, 2018. It is now available in E-book and Paperback at the links below. Bovine Colostrum saved Dr. Blake’s life and that of many other creatures great and small that he has had the honor of being their caregivers in his 44+years as a veterinarian, healer and teacher. 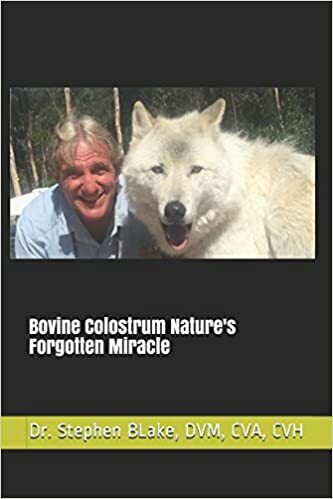 Please take a few minutes check out his book and learn about what he has discovered about Bovine Colostrum, Nature’s Forgotten Miracle. Please share my teaching and do your best to prevent suffering and do no harm in the process. Aho, and so it is. Blessings upon your days. For businesses, Imutek will set up a wholesale account for you and as long as you mention that Dr. Stephen Blake aka Dr. Colostrum recommended you order from them, you will receive a 10% discount on your first order over $100.00. This IS aGreat offer on an amazing product. All you need to do is call them at +1 (970) 493-7033 and mention my name and you will be on your way to having the most amazing nutritional supplement available for your clients and customers. NEWS FLASH for OUR Japanese Brothers and Sisters of Japan. You can NOW order Gemmotherapy for our Animal Friends on AMAZON.COM in Japanese. Shinpai Nia o Hitoni Shinsetsu ni ( No worries and Heal all ) in an E-Book form for OUR friends in Japan by clicking the link below. Domo Arigato gozaimasu . Dr. Blake aka Medicine Man’s list of supplements he recommends for Optimum Cell Replication aka HEAL-TH ! What BOOKS do the TWO Shamans, Stephen Blake AKA Medicine Man and Little Shaman Jackson Blake recommend you read?